I love fast food! Joe doesn't care for it as much as I do, but he does have a liking for Sonic. For a while there, it seemed as if we were stopping at Sonic about once a week on our errand day, if we happened to be going in that direction. Since we purchased our laptop a few weeks ago, we've been skipping our trips to Sonic. 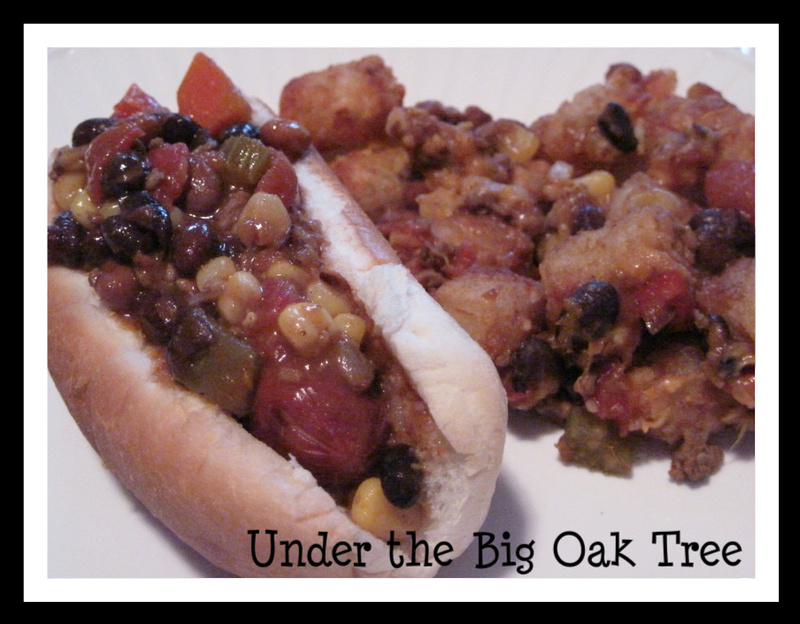 I was putting away the leftovers of our Cowboy Stew a few weeks ago and decided to use it to make an at-home version of one our favorite drive-thru meals: We love Sonic's Coney Island Hot Dogs and their Chili Cheese Tots could be a meal in themselves! Not exactly the same, but good enough to help stop the fast food craving and use up some leftovers in a new way! All I did to create this meal was heat the Cowboy Stew and top the cooked hot dogs and cooked tater tots. I used a slotted spoon to strain the broth from the soup and also left out any of the potatoes, since they wouldn't really work well for this topping. After topping the tater tots and hot dogs with the meat and bean mixture, I sprinkled the tater tots with cheese and popped them back into the oven to melt the cheese. Joe added cheese to his Coney Island and I ate mine without. Oh, it's nearly dinner time here in Germany and this is making me hungry! (They Cowboy stew looks great too) Thanks for sharing!